Synopsis: Sunny is sure this is going to be the best summer ever and she’s super psyched to be taking a beach trip with her friend Deb. But instead of a fun trip, her parents send her to Florida to spend a month with her Grandfather. Which would be fine…if he didn’t live in a retirement community…full of other old people…and it’s not even near Disney World. Plus she’s pretty sure this has something to do with her older brother, Dale, and that incident on the Fourth of July…which wasn’t her fault, right? Why I picked it up: Holm’s books are super popular with tween girls and they have come highly recommended by a number of classmates. Why I finished it: The subject matter in this book was somewhat unexpected, but it deals with a very real issue that affects families across the country. I only know of a handful of books for this age group that address substance abuse, and the message that comes across in Holm’s story is that it is important to speak up when you feel lost and confused. It’s difficult for families to talk about such heavy topics, but (if you’ll excuse the phrase), the struggle is very real. 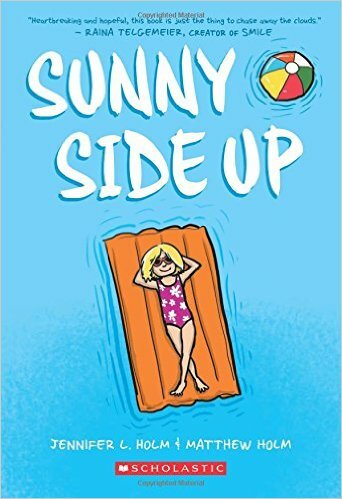 Sunny struggles with having to keep certain things that she sees a secret from her parents while the reader can assume that her parents are also struggling with trying to find help and how to talk to Sunny about what is going on. We see Sunny trying to make the best of the situation, most notably in a dinner scene in which she breaks the tension by talking about a school project. But what’s most important is the gradual understanding of the situation that makes Sunny more able to address her feelings about it. The narrative skips back and forth between Sunny’s time with her grandfather and the months leading up to her somewhat impromptu vacation, slowly setting the stage for the reader as we, like Sunny, come to terms with the situation and the realization that no one is at fault. This semi-autobiographical book is a poignant look at a girl who wants to be there for her family but doesn’t know how, and carries the message that it’s okay to ask for help. For some more resources on substance abuse, check out drugfree.org and the Substance Abuse Resources for Families website.